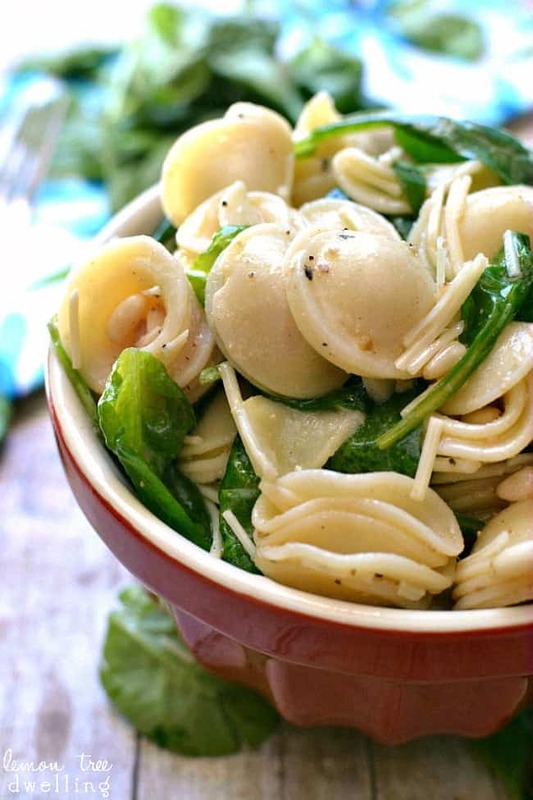 Orecciette Pasta with spinach, pine nuts, and Parmesan cheese in an oil & vinegar dressing. I’m the same way when it comes to home decor. Not that I don’t ever switch things up….I do. It’s just that I like to keep the old stuff, too…..in case I want to go back to it someday! So I end up with old rugs and lamps and vases and pillows, in addition to the new ones we’ve bought….and the reality is I will probably never actually want to go back to it. Because why would I?? It’s easy to let the same thing happen with food. Sometimes I’m tempted to completely load things up….to throw in everything but the kitchen sink! Don’t get me wrong….I love “loaded” things just as much as the next person….but every now and then it’s good to show restraint. To choose just a few things that I’ll really enjoy, and leave the rest for next time. This salad is a great example – just a few simple ingredients that are absolutely delicious together. Proof that less really IS more…..at least sometimes. Drain and rinse with cold water. Let cool to room temperature. 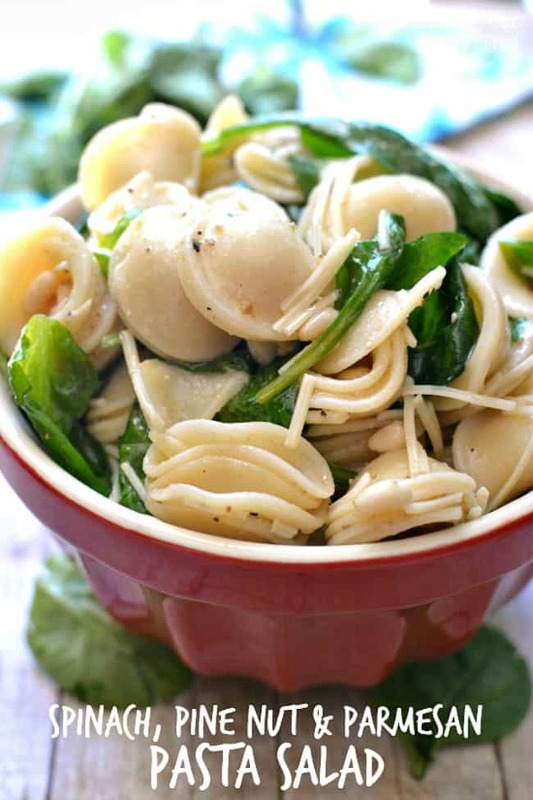 Stir in fresh spinach, pine nuts, Parmesan cheese, dressing, and lemon juice. I do the same thing Cathy – especially with clothes! What would make me NEED to hold onto my circa 1997 Corporate America blazers that I haven’t worn since, well…1997? And, although I have no attention to going back to **that** financial career, if I ever had to, wouldn’t I have to update it? Why yes I would but it’s so hard to say goodbye!!!! Anyway, your pasta dish looks amazing my friend!!! I can’t wait to try it and your Strawberry Shortcake Pops? Yes, I’m making THOSE for Sydney’s end of the school year party which is Thursday! Look at all the amazing things you do for me? And you didn’t even know it 😉 Have a great day my friend! I am the same with things.. my closet is full of clothes and shoes I probably wont wear again. My kitchen is full of things that Ive used once or twice. Well.. you get the point. lol. This pasta though? Perfection! I cant wait to try it! I want that for dinner tonight! 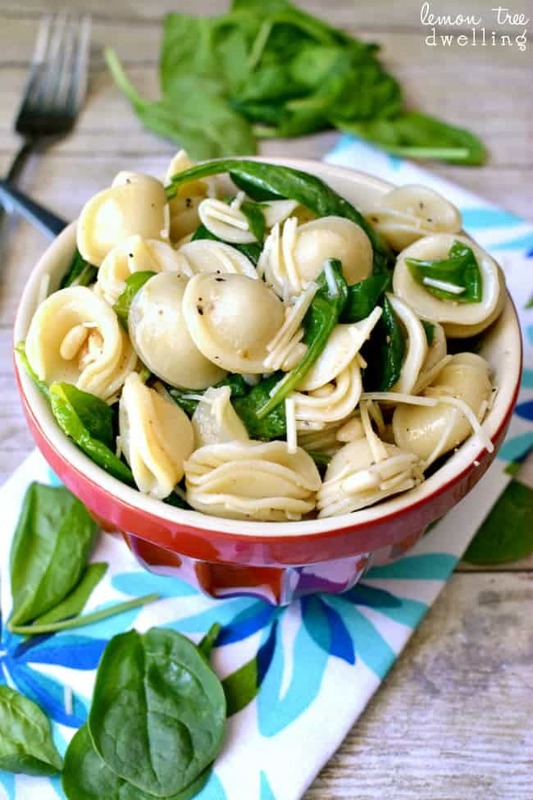 This pasta salad is so gorgeous! 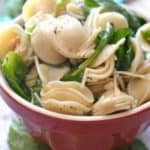 I love that pasta and the greens. It would be a beautiful side dish for a summer BBQ! Hi! Found your blog via iheartnaptime link up. 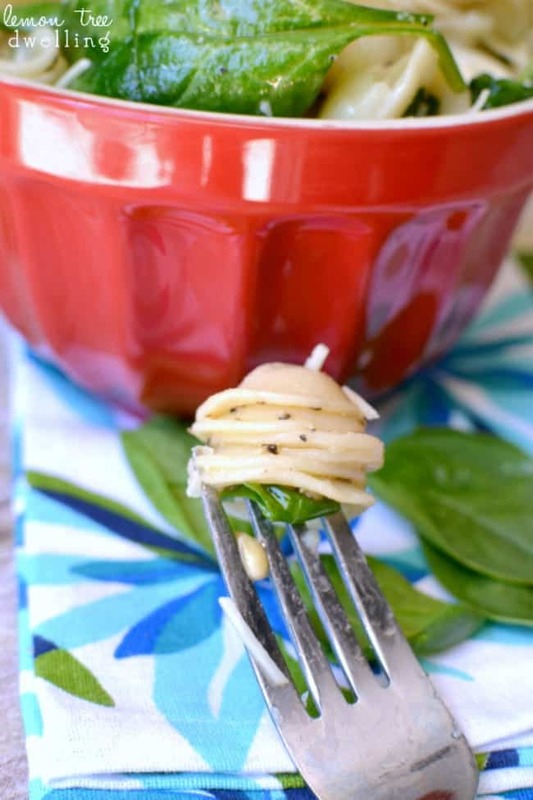 This looks so yummy and I am so happy I have all of these simple ingredients already on hand. I will definitely be making this for lunch today. Thank you for sharing! 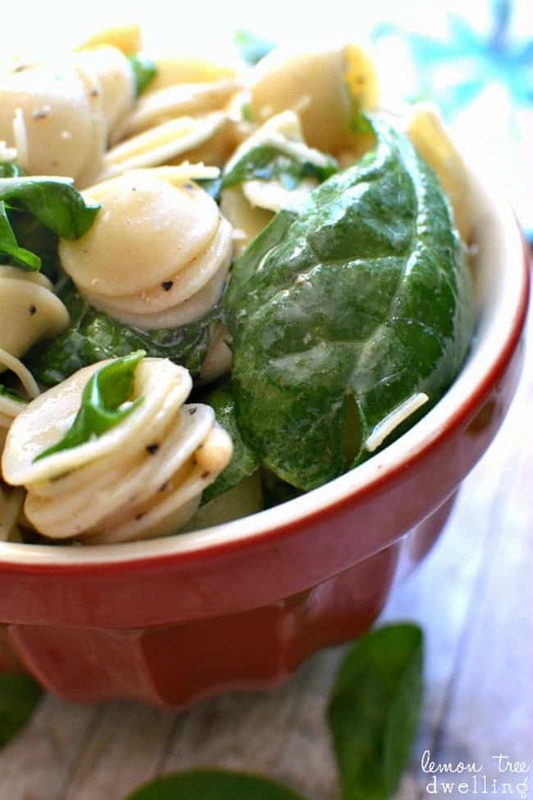 How many people will this recipe for Spinach, Pine Nut and Parmesan salad serve? Did you make your own oil/vinegar dressing? If so, how did you make that? Or which brand of store bought do you suggest?